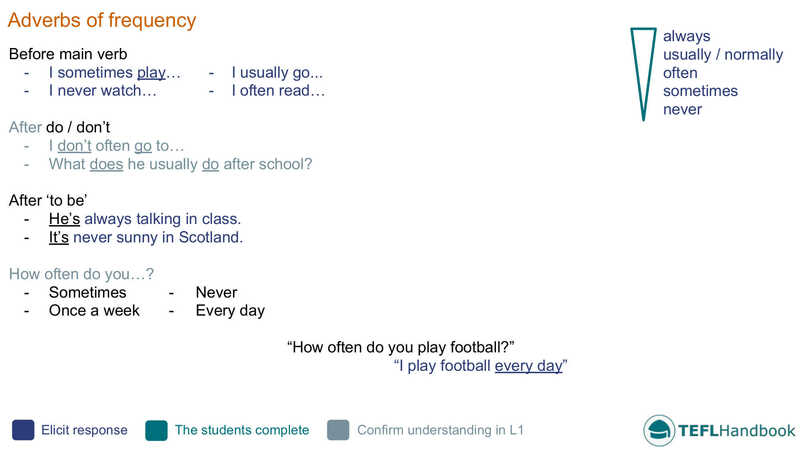 An ESL lesson plan for teaching adverbs of frequency to elementary level students (A2). It includes a lead-in activity, some practical ESL classroom activities and a game. The best way to view this content is through the TEFL Handbook app. So if you have an iOS or Android device, be sure to check it out. The sample board below suggests one way to present adverbs of frequency to your students. First, attempt to elicit as many frequency adverbs as possible and add them to the side of the board. Then explain the grammar rules related to the position of frequency adverbs and frequency expressions in sentences. For this ESL activity, the students will write five sentences about themselves using adverbs of frequency or frequency expressions. They should write one sentence using each adverb. When the students have finished writing, they can swap books with a partner and report back what their partner has written in the third person. Another ESL activity that will give your students some practice using frequency adverbs along with verbs in the third person. The students write five sentences about other people (Family, friends, famous people). Have them write one sentence using each adverb. When you feel you have enough ideas, have the students make sentences that are true for them and their family. Depending on the size of the class, five to eight should be enough. Our suggestions for ESL games and activities require the minimum of resources (whiteboard markers, dice or dice app.). Divide the class into two teams. On each turn, give one side a frequency adverb from the list without the other team knowing what it is. That group must then think of a question that will draw the given frequency adverb in the response. For example, the team has been shown 'twice a week' and ask "How often do you go to English Academy?" The student who is responding must tell the truth, and if their answer contains 'twice a week', the other team wins a point. For more activity ideas to teach frequency adverbs, check out this list of activities, worksheets and games from teach-this. And again here at EnglishClub. If you need some free EFL - ESL worksheets to test your students, islcollective have an excellent collection that covers the breadth of the A2/Elementary level for this topic. We hope that you've found a few of these ideas useful. Our suggested next lesson is on ordinal numbers. Be sure to check out our complete list of elementary level ESL lesson plans, A2 lower and A2 upper, as well as our entire collection of ESL lesson plans. Also, if you are an iOS or Android user, this lesson plan is available for free on the TEFL Handbook app. An ESL lesson planner for English teachers.